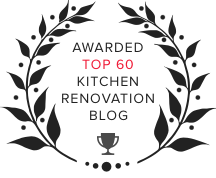 Think that all kitchen drawers are made alike? Well think again! Dovetail drawers offer many benefits that regular drawers just can't match, continue reading to find out just what these benefits are! What Are Dovetail Drawers, Anyway? 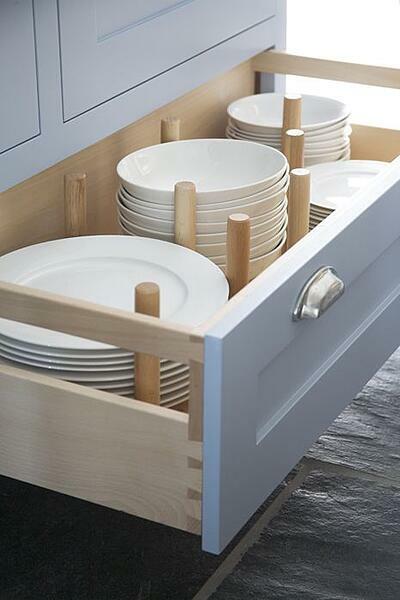 Dovetail drawers require a different type of construction than standard kitchen drawers, and are usually regarded as a higher quality drawer option for homeowners. The difference between dovetail drawers and other, more traditionally constructed drawers, lies within the type of joint used in dovetail drawers. The type of joint constructed for dovetail drawers is known as a ‘locking joint.’ The dovetail ‘locking joint’ is constructed from wedge-shaped channels cut into the wood, that interlock with one another from either side of the drawer, creating a box. The wedge-shaped pieces are called ‘tails’ and ‘pins,’ and provide a very strong joint that is quite resistant to force once the two sides are assembled. The dovetail joint is so strong that oftentimes when a drawer breaks, it is not at the point of the joint. Not only is the ‘locking joint’ itself strong, but the joint’s surface is large enough to offer an unusually large area for gluing. Glue is stronger than wood, and therefore the more space that is available for gluing allows for an even stronger drawer box. 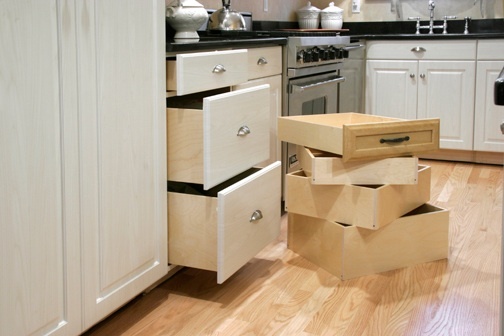 Due to the construction of the joint, dovetail drawers also offer the largest storage space. 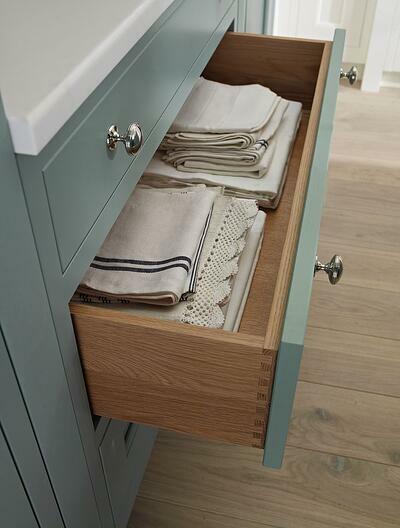 English dovetail drawers, which are the type we have been talking about, allow for the largest possible drawer, regardless of the type of furniture. French dovetail drawers are a proper choice for specialty furniture, like pieces with curved fronts. Joints on French dovetail drawers are constructed slightly different, with the drawer side sliding upward into a long groove at the drawer’s front. The advantages of dovetail drawers are in the construction of their joints. They offer a stronger drawer, with a larger holding capacity. While these drawers are associated with a higher quality drawer, this is not always the case. 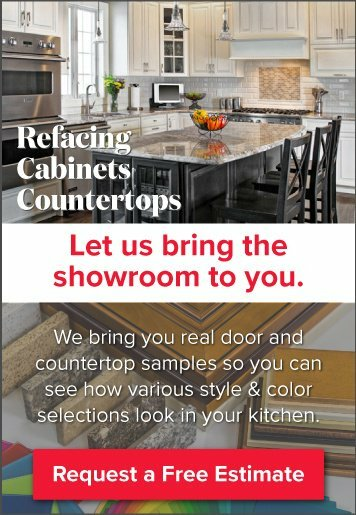 There are many options for drawer construction, and picking the correct drawers for your kitchen cabinets should include strength and storage. Ever heard of soft-close cabinet doors? Check out our blog article, "Blumotion Hinges: Finally, You Can Slam Your Cabinet Doors in Peace!"